This is the year bros went mainstream. No longer viewed as the Axe-sprayed armpits of the nightlife scene, we're the subjects of think pieces examining our literary habits and demographic trends. But have you ever seen an old bro? Pardon my existential crisis, but what happens when bros age? Do years of Beast Ice and N.O.-XPLODE cause my kind to self-immolate? 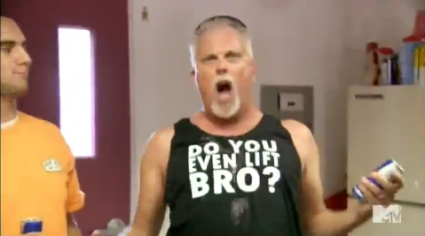 Thanks to MTV’s True Life: My Dad is A Bro, I’ve found my answer. MTV followed two lions of bro-dom, Dave and Barry, who conquered time, shared their secrets, and let the world know how they keep the party going in between prostate exams. Dave knows breakfast is the day's most important meal. You have to use those precious moments to pre-game. That's quality Bud Heavy being poured into his cereal. Dave and Barry's supernatural testosterone levels have rendered them unable to produce sons. Dave has done what any self-respecting bro would do: raised daughter Desirae as the perfect beer pong partner. Dave and Desirae throw their neighborhood's best bangers, which include adult piñatas stuffed with rubbers and airplane-sized vods. If the party doesn't have a kiddy pool, I'm not going. In between hangovers, Barry learned how to upstage his kids. Two words: bouncy castle. But while Dave has most likely cooked breakfast for Desirae's one-night stands, Barry cockblocks daughter Tori at every turn. Tori's boyfriend must really love her. Normal, weaker fathers meekly send their children to their rooms. When Tori stepped out of line for being arrogant enough to believe she was a better drag racer than Barry, the bro-triarch knocked her down a few pegs in a friendly father/daughter race. I invest a lot of time, energy, and money to upkeep my brosique. But once I'm old enough to join the AARP, I'll only need to train one arm. I can finally throw out all of the fresh chicken and egg whites I consume daily. All a major-bromo requires is to shotgun Red Bull. It's comforting to see fully developed bros enter their golden years raging more intensely than they did as youths. In a country of rising absentee fathers, Dave and Barry deserve to be paraded about like the national treasures that they are.